Cell identification is important for Excel worksheets, both when you are using formulas and when you are having difficulty determining which row or column a cell belongs to. Cells are typically referenced by their row and column location, which you can determine with the help of the row numbers at the left and the column letters at the top of the sheet. These identifiers are called Headings, and their presence both on your screen and on the printed page can be turned on or off. 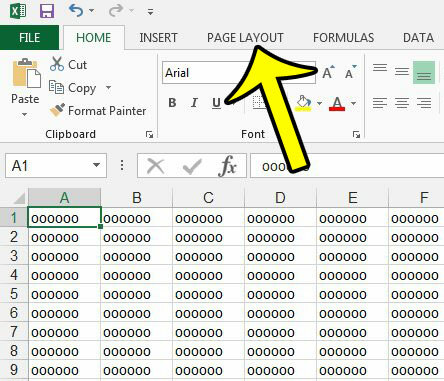 Our tutorial will show you how to turn off the headings in Excel 2013 if they are currently being printed, but you would prefer that they were not. The steps in this article will assume that your spreadsheet currently includes column letters at the top and row numbers at the side when you print. When you have completed this guide, these row headings will no longer be part of your printed document. 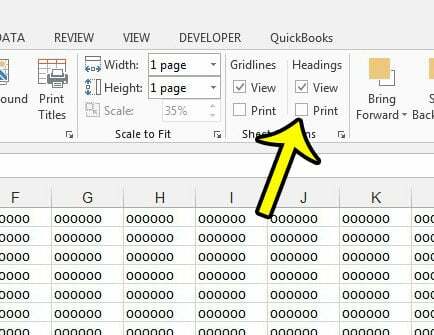 if you are instead concerned about a single row or column that is printing on every page, you can learn how to enable or disable headings when printing in Excel. Open your workbook in Microsoft Excel 2013. Click the box to the left of Print under Headings to remove the check mark. You can also adjust whether or not the headings are visible on your computer screen by adjusting the View option in the Headings section. Now when you go to print your worksheet, those headings will no longer be included. Note that this setting is applied at the worksheet level, so you will need to adjust this setting if it is enabled for other worksheets in this workbook. Is your spreadsheet printing with or without borders, and you are having difficulty changing the setting? Learn how to adjust both the border and gridline settings on your Excel worksheet so that your sheet is printing according to your needs.